Better Homes and Gardens magazine published an article last fall about saving your summer geraniums through the winter. They claim that geraniums can survive in a dormant state for long periods of time. I ripped the pages out of the magazine so that I could try the idea on my plants, but then the fall season came and went and my poor little dying plants froze. I was too late. This year, however, I am not going to let time and the weather keep me from experimenting to see if the idea actually works. The article says to dig up the geranium before the first frost. I know that I am a little early, but my plants have been looking a little less than stellar the past few weeks anyways. And I might as well try this when I'm excited about it, rather than loosing interest and not doing it at all. In the past, I've tried to bring the plants indoors to overwinter them, but this requires space in a sunny window and you have to remember to water them just like you do in the summer. I have neither the space or the dedication to keep the plants alive through the winter. The idea that Better Homes & Gardens presented requires neither of those conditions, so my curiosity was peaked. 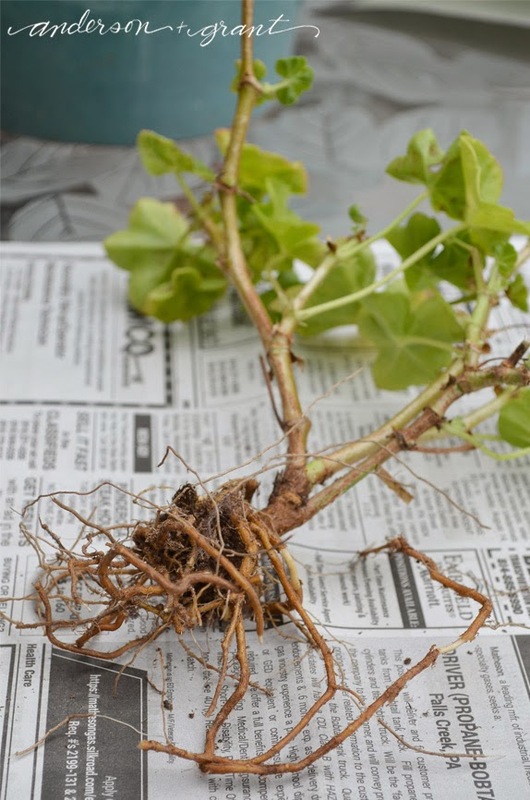 Dig up the geranium plant and shake the soil off leaving just the bareroot. While it doesn't say to do so, I also took off the leaves that were not longer green and vibrant. Roll the plant up in newspaper. Again, the article was not clear. Does the entire plant needed to be wrapped or just the roots? I wrapped one geranium totally in newspaper and the other I wrapped just the roots. Store the wrapped plant in a dry, cool place. I chose to put mine in a dark corner of the basement. Two or three times during the winter, the plant needs to be removed from the newspaper and soaked in water for one to two hours. 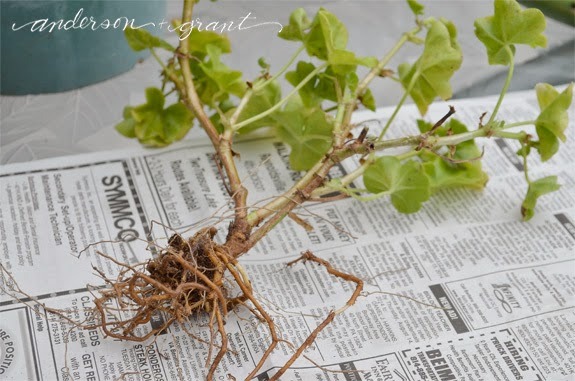 Remove any dead stems or leaves and allow the plant to dry before wrapping it back up in the newspaper. When spring comes and the weather gets warm, plant the geranium again in fresh soil and water it well. Supposedly, it will come right back and grow like normal! Have you ever tried this with your plants? Do you think it is actually going to work?